Not to say that NASA doesn’t care about preserving such things, but it’s not their top priority, especially when faced with increasing budget cuts while at the same time being asked to plan for more ambitious missions (like to Mars). If it’s possible to lose that recording – possibly the greatest moment of mankind since maybe harnessing fire – shouldn’t we be thinking harder about not letting such things disappear? The Internet, and digital technology in general, allows us the opportunity to never even have to worry about such things ever again. When such a defining moment happens these days it ought to be recorded digitally and sent out so that people will see it, be amazed, realize it’s important, and download it to their computers. Fortunately, something similar has happened with NASA, as it appears the only copies available now are those that were sent to television stations for broadcast. Again, strength in numbers. In a way that gets little attention, this is what Google is trying to do with Book Search. There are millions of books whose “owners” are not properly motivated enough to ensure that they will be read in the future. Rather then allow for such a valuable project to proceed, the “owners” think it better to sue under the thinking they might get a few extra nickels out of the deal. Though Google is only one, it is better than no digital backups, which was the problem NASA had with the original recordings. The larger point to remember is that when control of important works is entrusted to a select few, the odds of losing a significant moment that defines a culture, a species even, is more likely to be lost than if it were widely distributed. Preservation seems to get little attention these days when it comes to IP issues and the Internet, unless you take the position that locking things up produces more, because if it gets lost, then the only choice is to create more to fill the void in the market. Tom Evslin has perhaps the best post I’ve seen yet on network neutrality. In the end, it’s all about whether there is enough competition between the telcos, because if there were, this whole network neutrality thing wouldn’t be an issue. Just found a great site called Internet Cases run by Evan Brown. He reports on a recent decision on personal liability in trademark disputes. The case, Qwest Comm. Int'l, Inc. v. Sonny Corp., (Slip Op.) 2006 WL 1319451 (W.D. Wash., May 15, 2006), read here, stands for the proposition that a "Select a State" drop-down menu on a purchase webpage constitutes purposeful availment for establishing personal jurisdiction over an out-of-state defendant. Internet Cases has a great rundown of the case. Basically, in order for Qwest to sue Sonny Corp., a Michigan business doing business online, in Washington state it has to show that Sonny directed activity towards the state of Washington in order to business there. It may seem odd to think that selling goods online could expose you to being sued in any state where your website is available, but generally, courts require something more than mere passive commercial activity (ie. just running a website). Sonny Corp. runs Questy.com, a site that sells "Qwesty's," stuffed question marks kids can use to signal preoccupied parents that they have a question that needs answering. Qwest's lawsuit claims, among other things, that Sonny's use of "Qwesty" diluted its trademark. …and decided it was enough to say that Sonny Corp. directed its actions towards the state of Washington. 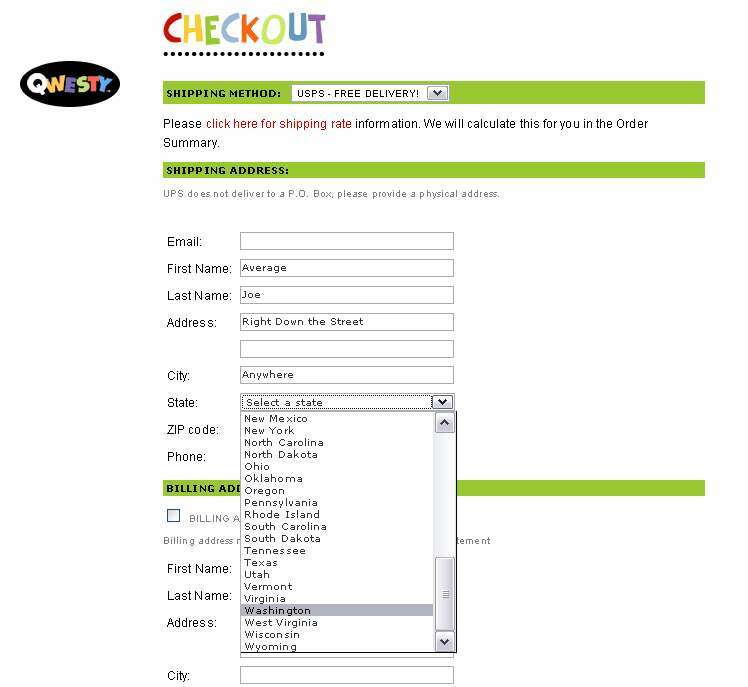 If the Qwesty site did not have a drop-down menu, if it required customers to enter their state into a field on their own, then it would probably have been off the hook. The decision, however, seems to require that website operators who use such drop-down menus either accept personal jurisdiction in all states or that they include in those menus only the states that they agree to be sued in. Both seem to be an excessive regulation over how websites are created.